The board wants insurers to get an 80 percent coinsurance rate for 2015. Managers of the state-based Maryland Health Connection have been thinking about how insurance for carriers will work next year. Managers are thinking about providing enough supplement reinsurance to make sure health insurers get enough reinsurance money to compensate for 80 percent of the cost of eligible reinsurance-covered catastrophic claims. Outside consultants have told the board that offering that much supplemental reinsurance could help reduce premium costs by 2.9 percent. One challenge is that the consultants aren’t sure how what an influx of previously uninsured patients with serious health problems might do to claim costs. The consultants estimate it might boost costs by 10 percent. Another challenge is that the consultants still aren’t sure how the U.S. Department of Health and Human Services will run its part of the reinsurance program in 2015, according to a presentation included in a Maryland exchange board meeting packet. The Patient Protection and Affordable Care Act now requires carriers to sell coverage to consumers who apply during open enrollment periods, or who qualify for special enrollment periods, on a guaranteed-issue basis. Carriers that sell PPACA-compliant individual plans must offer coverage to eligible people who are about to get heart transplants for the same price they offer coverage to people in top condition. PPACA drafters created the temporary reinsurance program to give health insurers some protection against a sudden influx of individual policy and small-group plan enrollees with huge medical bills. 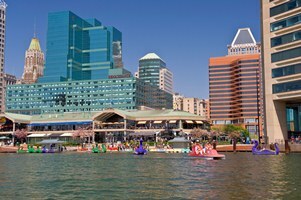 In 2011 and 2012, about 2,000 individual Maryland residents had claims over $50,000, according to the exchange consultants. The performance of a state’s reinsurance program could have an indirect effect on the large-group market, by affecting overall profitability. In states with state-based exchanges, the federal government is running the main part of the reinsurance program, and a state can provide supplemental reinsurance coverage. In 2014, the “attachment point,” or reinsurance deductible, for the federal reinsurance program is $45,000, with a cap of $250,000. The coinsurance rate is 80 percent, meaning that the federal reinsurance program will pay 80 percent of an exchange plan’s eligible claim costs between $45,000 and $250,000. In 2015, the cap could still be $250,000, but the attachment point may rise to $70,000, and percentage of catastrophic claims the federal government will pay could fall to 50 percent, according to the Maryland exchange consultants. The consultants note that it’s not clear whether the federal reinsurance program coinsurance rate will really be 50 percent, or some higher or lower rate.